Happy Spring everyone! 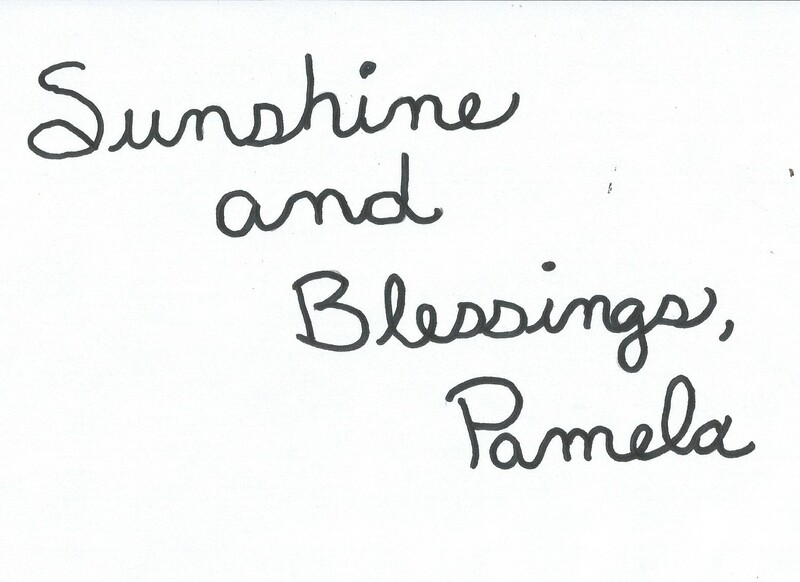 I hope the weather is cooperating wherever you are today! Ours is so beautiful! I have to enjoy it now, because I know this summer is going to be very hot! 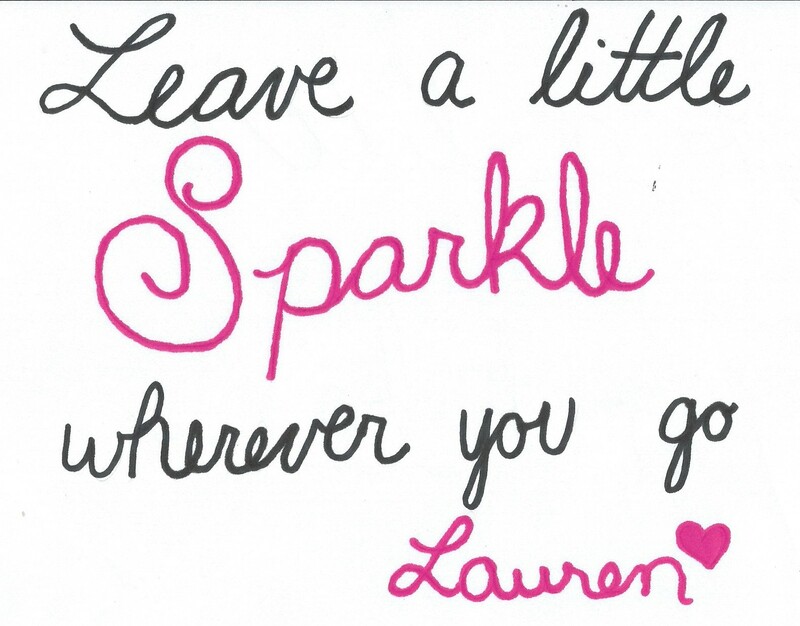 Last summer, Lauren was getting ready to move out to an apartment to go to college in another town. This was a very difficult time for me. We always spent lots of time together and I knew this wouldn’t happen as often. I was excited for her and knew this was what was supposed to happen in life, but it was still a hard time as a mom. So to help myself in the process, I planned how I was going to redecorate her bedroom. 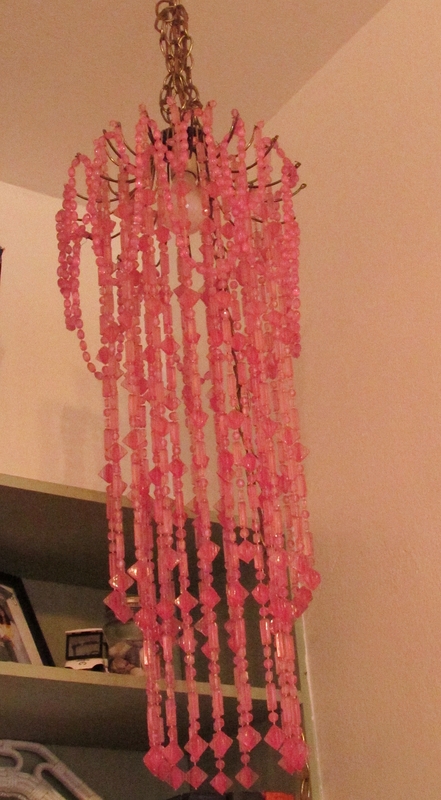 I knew I still wanted to keep it for her, because she would still be home quite a bit, but I couldn’t go any longer with this….pink! 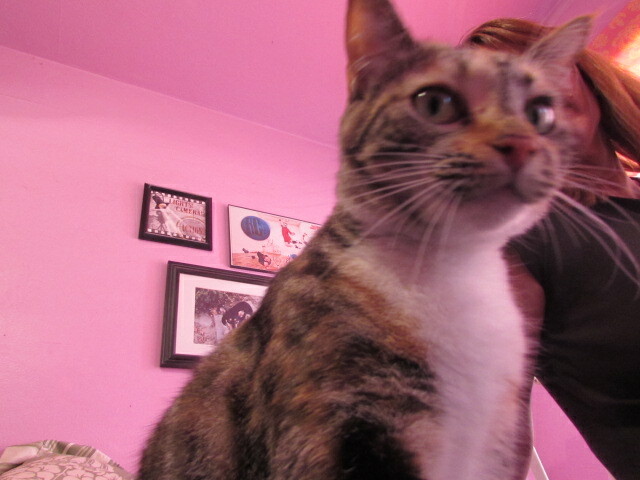 Sorry for the cat-it was the only picture I could find of the pink walls! Remember, this was before I was blogging! Her room was soooo full of stuff! 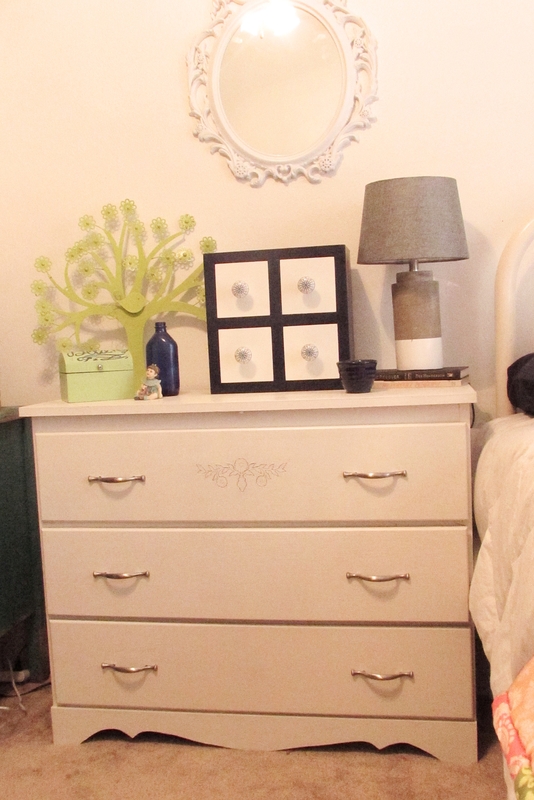 We went through every item in her drawers, closet, shelves, everything! The room she was moving into was furnished, so I would still have the furniture, but everything else was taken down or removed. Lauren was sad to see the pink go, but I just had to have something a little more soothing. I knew I was moving my scrapbooking stuff in here and there was no way I was going to be able to work with that pink staring at me all the time! The first step was to primer and paint all the trim. The trim was the same as the hallway, which you can see here. This included all the baseboards, door and door frame, closet door and frame, and the windows and frames. I spent two weekends just on the trim! Finally, I could do the walls. 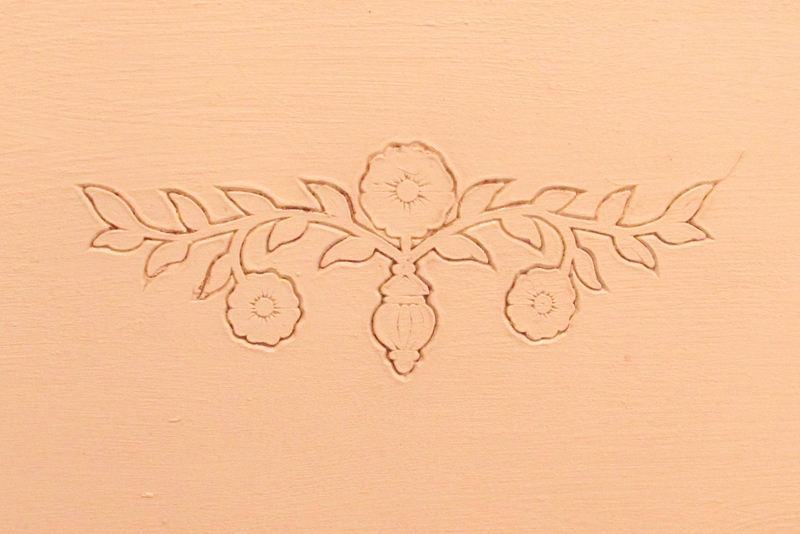 I used Concepts paint from Orchard Supply, semi-gloss in Simply White. Ahhh! Love the simplicity! The full-size bed was my mom’s sisters bed from when she was a girl. My cousin had it for awhile and repainted it, but now it is ours. I could use another paint job, but I kind of like the chipped look. 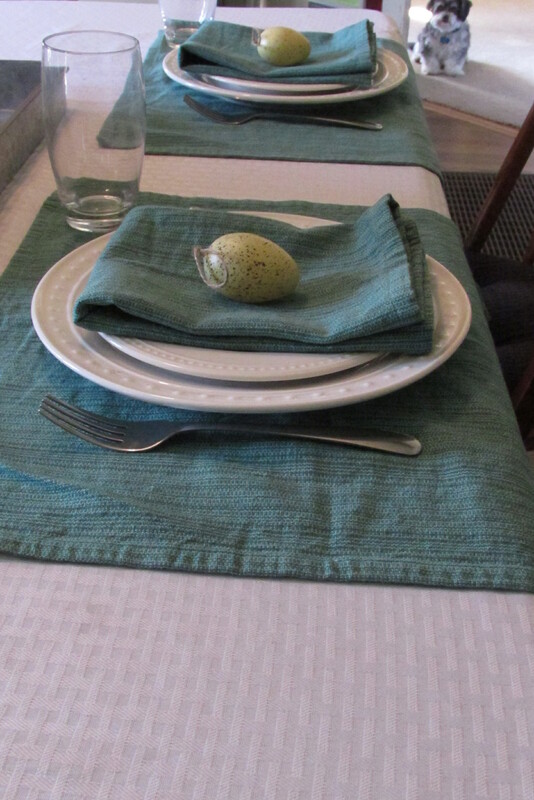 I purchased the white comforter, green pillowcase and little white and green pillow from thrift stores. 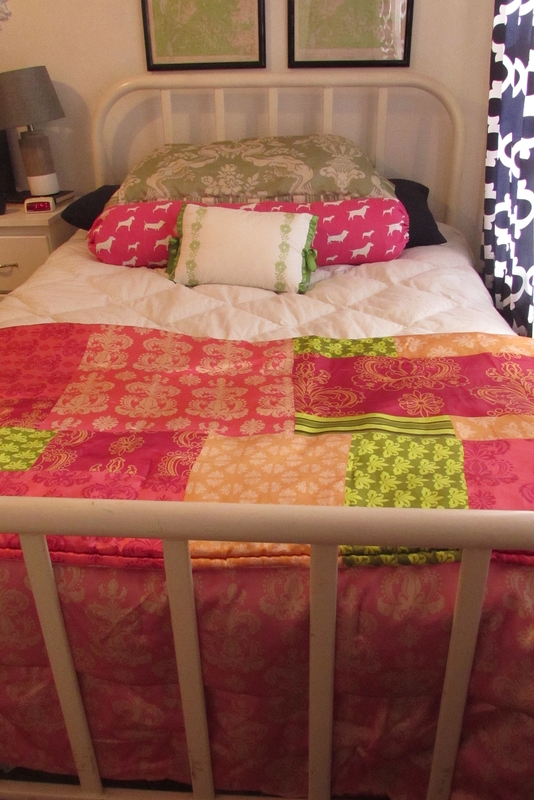 The pink boho bedspread was Lauren’s from before but she got a new one for Christmas. There was actually a larger dresser in here, but my other daughter, Haley, wanted it, so this was the changing table from when the girls were babies. It was brown and I repainted it white and added new handles. The smaller size was a better fit too. I really like how this turned out! My younger daughter used this box to store her American Girl shoes and accessories in. 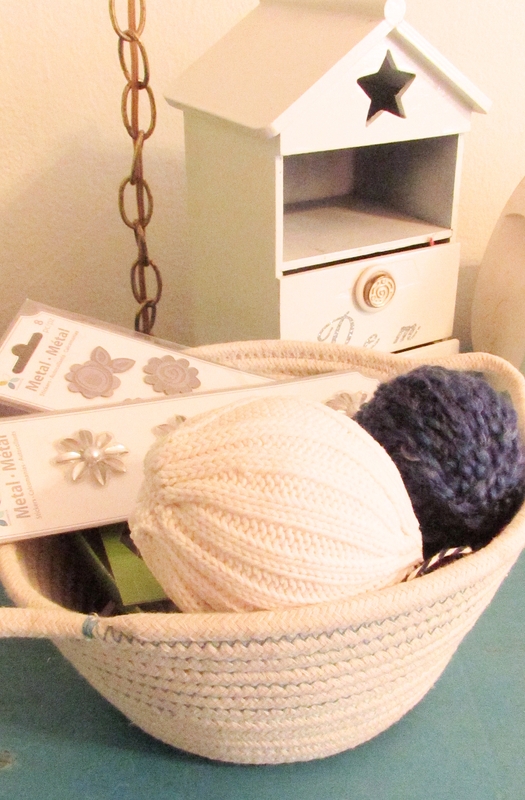 It was a bright blue and had yellow stars for knobs. 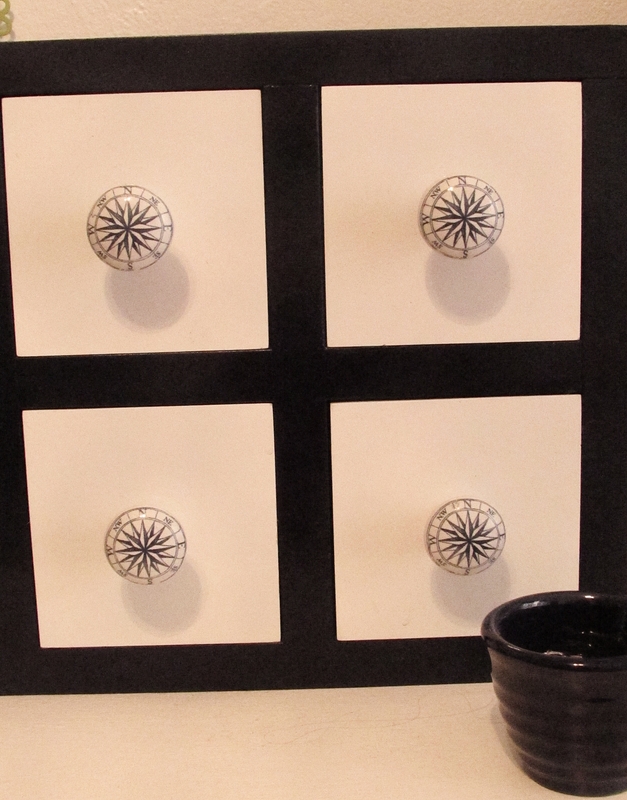 I painted it navy blue with white drawers and found these compass knobs at Hobby Lobby. I loved how it went with the maps that I hung above the bed. 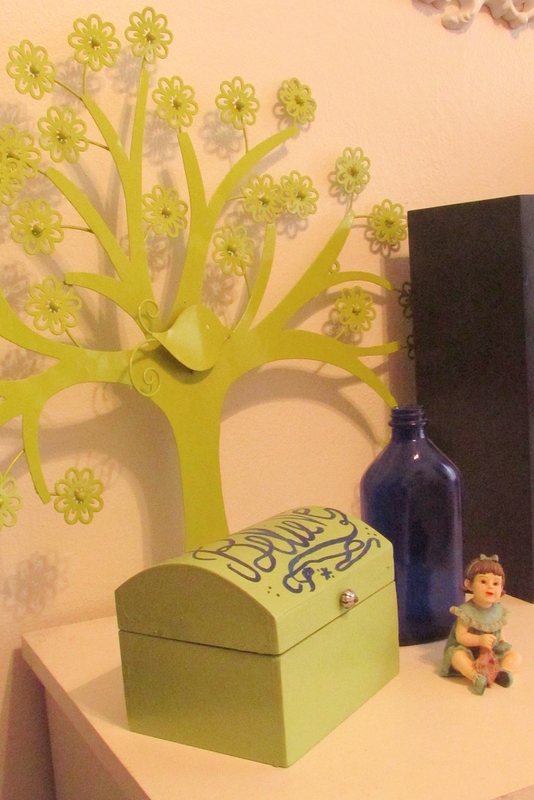 I added this metal tree from Hobby Lobby, the little wooden box, a blue bottle and a little girl with her blankie, because my girls had blankies too. Opposite the dresser is a little sitting spot. 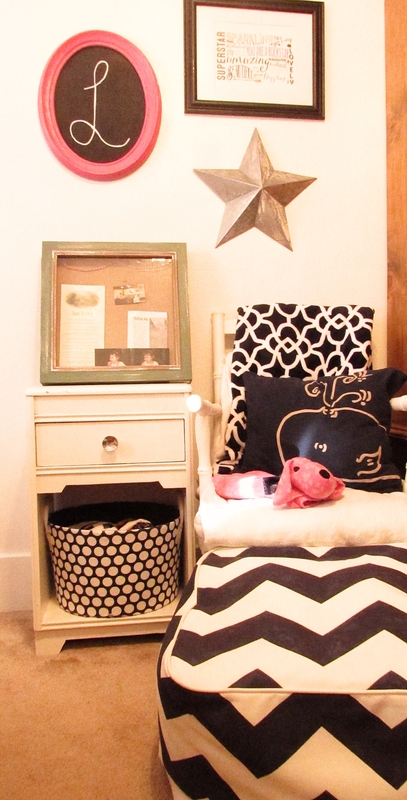 I added an old chair from my grandpa, a Target ottoman found at Goodwill, Lauren’s old nightstand and a polka-dot basket from HomeGoods. The blanket I got for Christmas, the pink dog from Target and the whale pillow I made from a t-shirt soften up the chair. 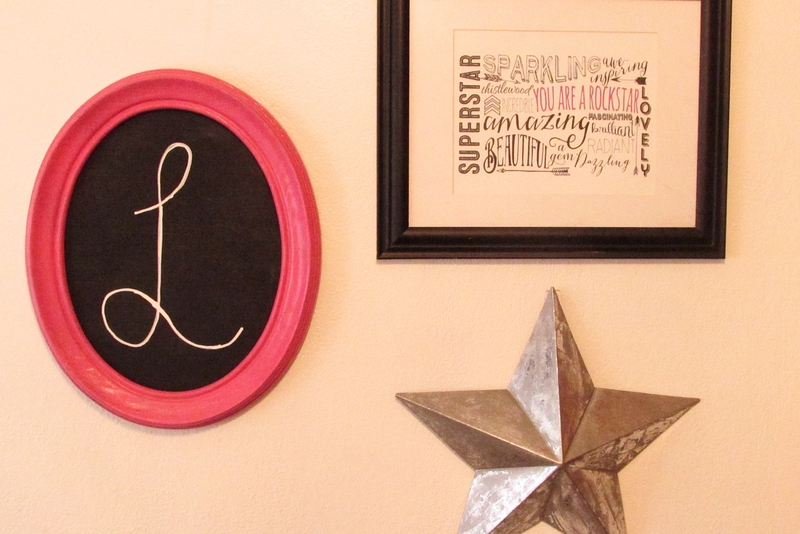 The wall hangings include a metal star, a pink framed chalkboard with a giant ‘L’ and a great print from one of my favorite bloggers, Karianne at Thistlewood Farms. You can find your own print here. 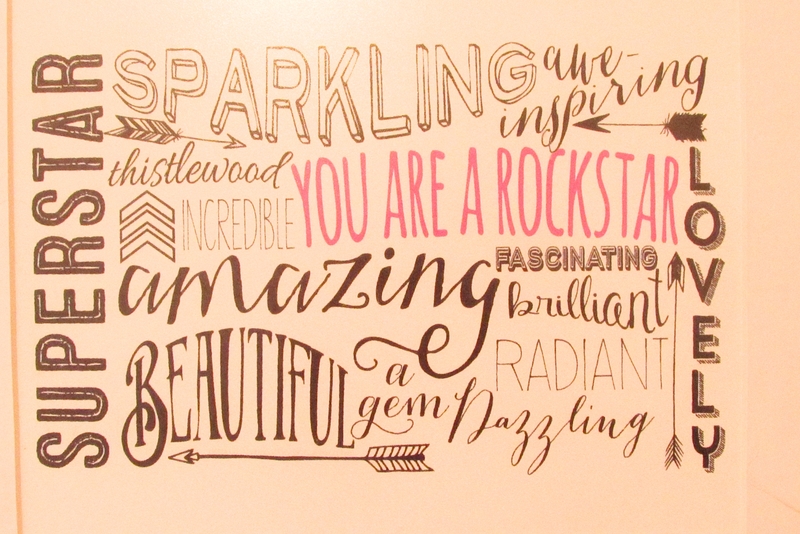 I think all of us need to hear these words once in awhile! 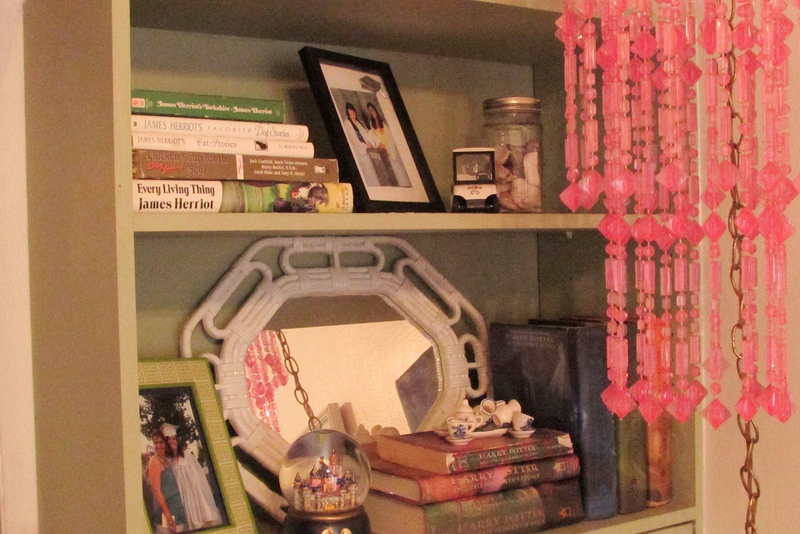 Across the room, next to the door, are some bookshelves we installed when Lauren was younger. I left them painted green, for now, and just restyled them. 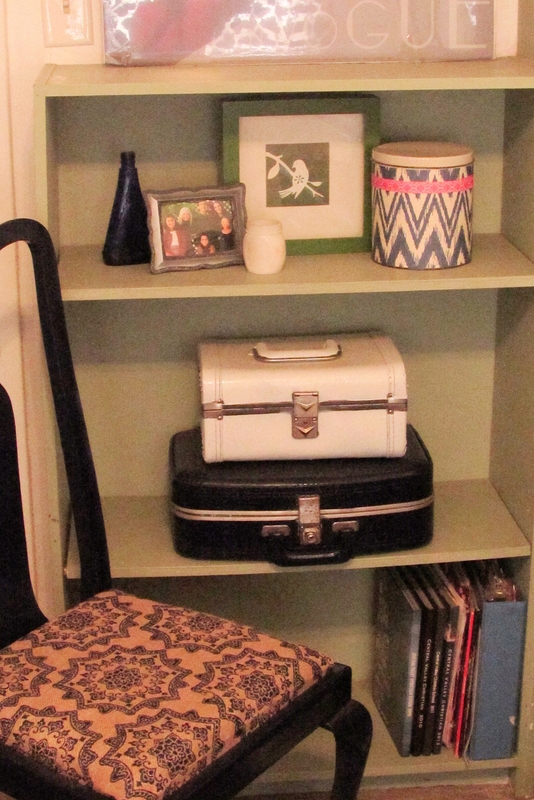 I added some old suitcases that I keep fabric in, and some other odds and ends. Some of Lauren’s favorite things. On this side are a couple of pictures of best friends, her Harry Potter books and James Herriot books, a small tea set from Holland and a Disneyland snowglobe. I also added a replica golf cart to remind her of her golfing days! Isn’t this lamp awesome! It used to hang in a hair dresser shop. I got it from a yard sale and it was full of sticky hairspray. I took some cleaning to get it to look good, but I love how funky it is! 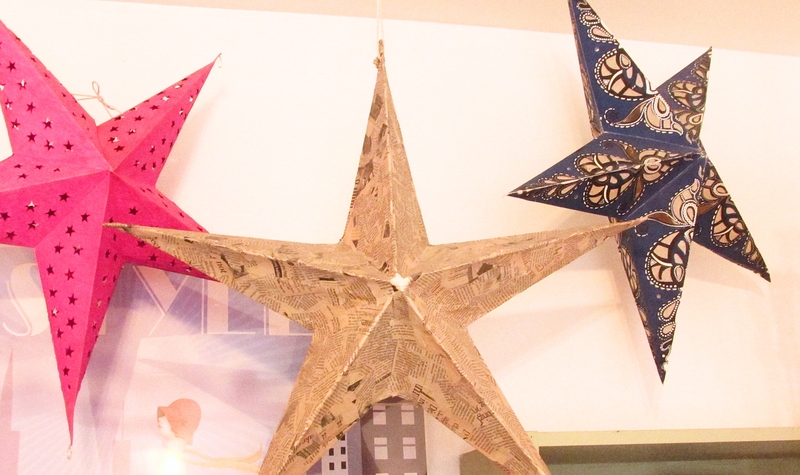 I also added these hanging stars above the shelves. Lauren decoupaged the middle one with lots of pieces from an old book. It took her a long time, but it looks great! The last piece of space is filled up with this old teacher desk. Haley and I picked this up from a Freecycle ad. As soon as I saw the color, I knew I had to have it! I touched it up a bit, but not much. It sat on my porch for almost 2 years before I finally got to use it. 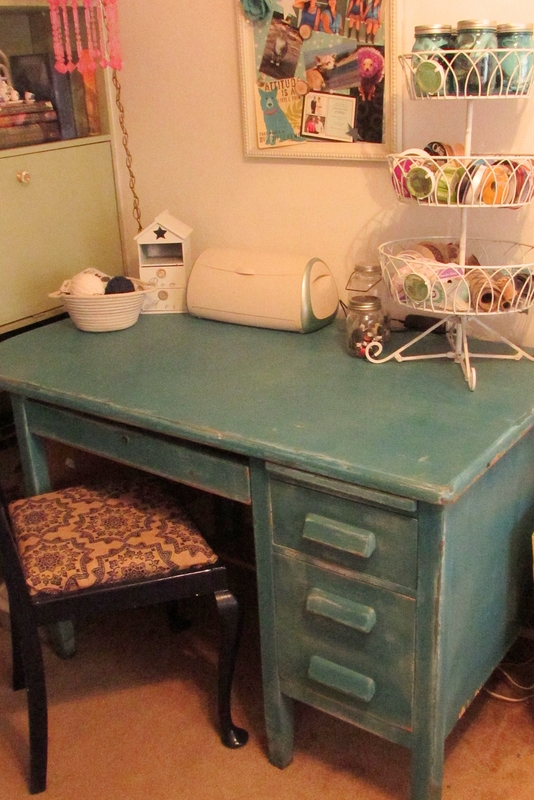 I knew I wanted it for crafts and scrapbooking because it has such a large work surface. 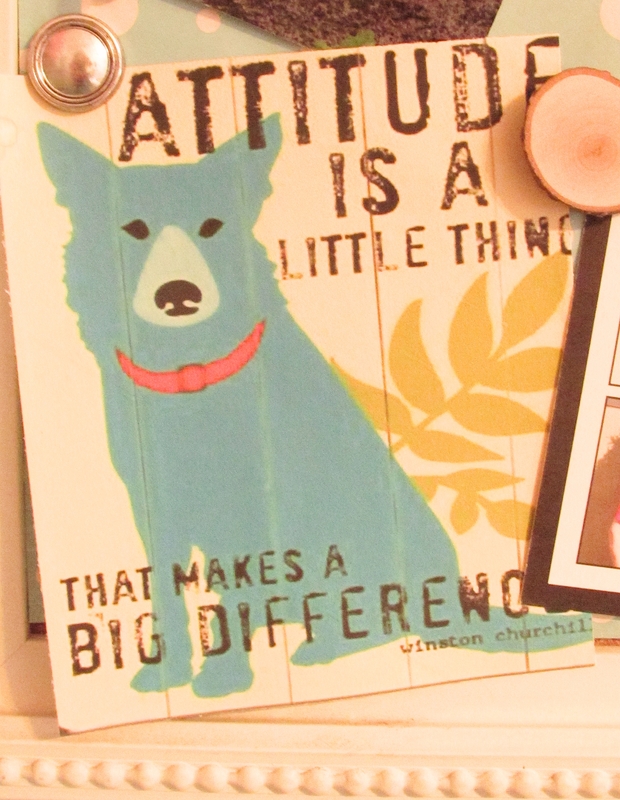 The drawers are really deep and I can keep my paper and other scrapbooking supplies in them. 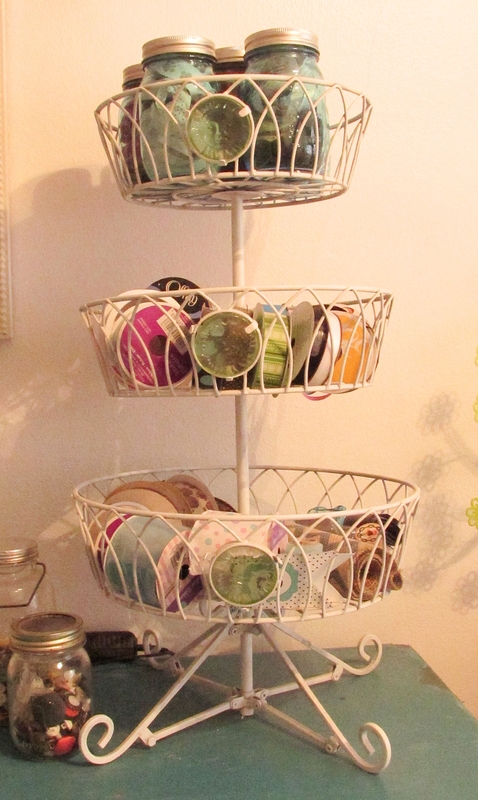 I use this plant stand for a ribbon holder. It’s so nice to be able to see what I have available. I also have a couple of jars of buttons. 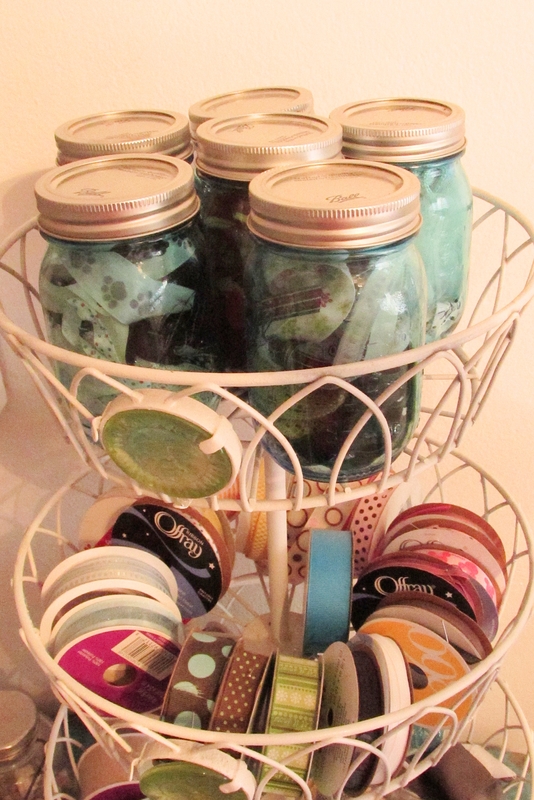 The blue jars on top are filled with the small scraps of ribbon. 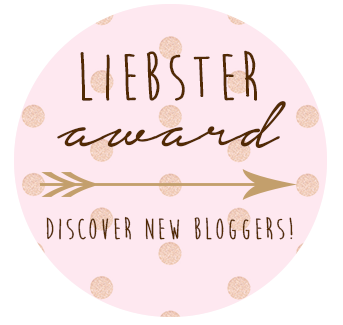 I won these jars from a blogger and I love them! I had to find a way to show them off! These are just some extra little pieces. The basket holds miscellaneous stuff. I painted the little drawers sitting in the back and was going to add words to the front, but I didn’t have enough sticker letters and then couldn’t find the same ones in the store. So, it’s still sitting there from before Christmas! I will get to it sometime! 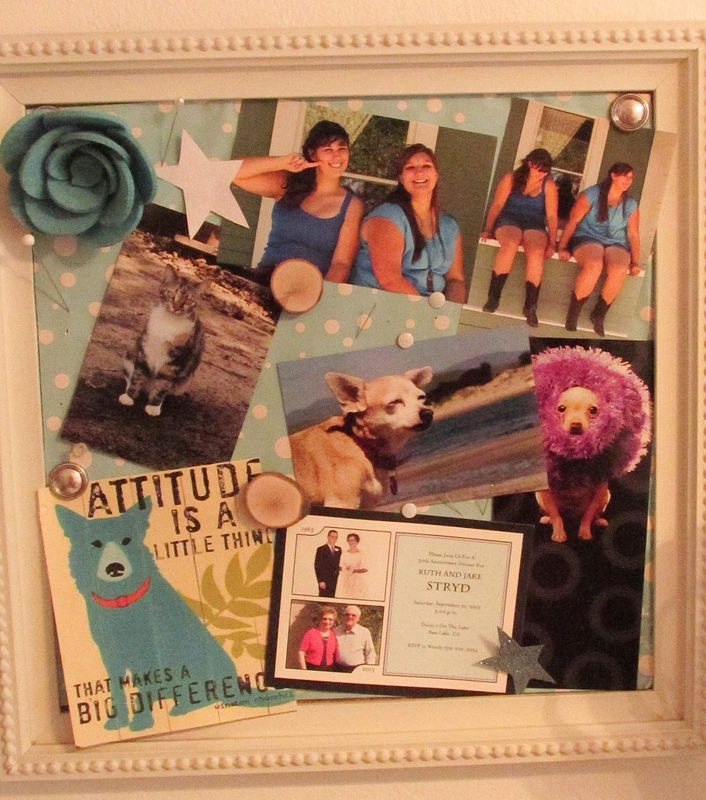 I hung this bulletin board above the desk and added some of my favorite people and things so that I can be inspired each time I look at it-my girls, my parents, a couple of my pets and funny card and an inspirational saying. I hope you enjoyed this little tour! I had fun decorating and it helped fill my time. 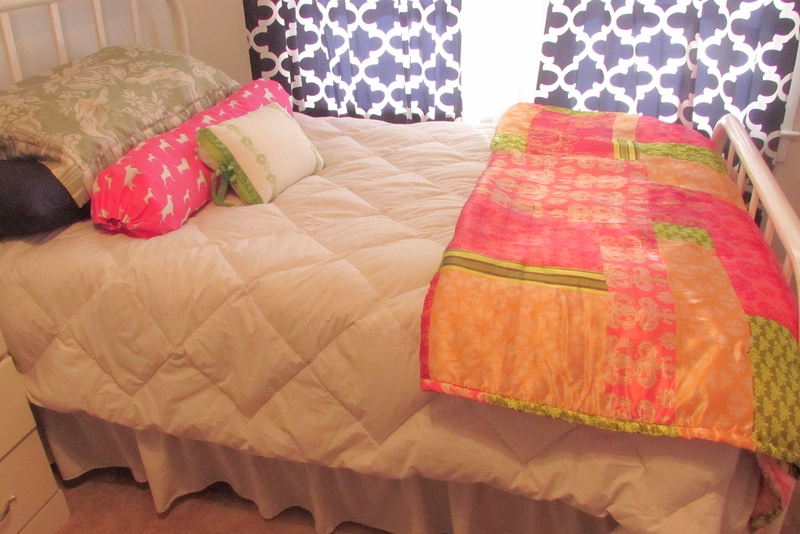 I enjoy making it look nice for when Lauren comes home and stays for a bit. 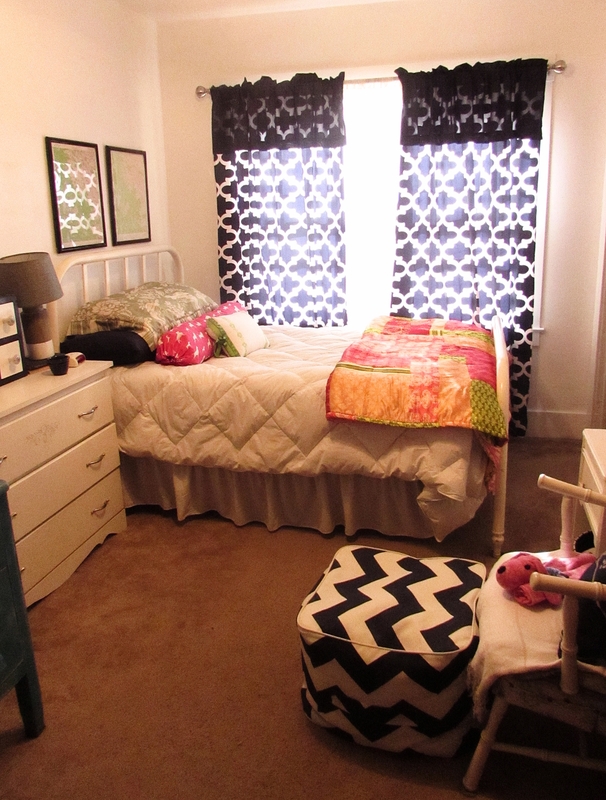 I think this room has become a beauty after its makeover! There are many times where we go into a Starbucks or Jamba Juice and someone orders a drink you had never heard of. Did you just miss it on the menu? Or did they just come up with something off the top of their head? Well…a little bit of both. These are normally secret menu items. Items that the restaurant may know how to make, but at the same time, the restaurant may not know how the drink is made. You can either take a chance on if they know the drink or you can find a recipe online. Or, I can make it even easier. Thanks to hackthemenu.com, anyone can see secret items and how they are made. And I have taken a challenge to try all of these drinks from Starbucks and Jamba Juice, write a review of the drink for you, then attempt to make it myself with recipes online, and finally have people (roommates and family) taste the real version and the fake version and see if they can tell the difference. Let me start off by saying that this is a very popular drink. So much so, that this is the drink I normally order when it is 150+° in California. I don’t think the Central Valley has ever reached 150+°, but you get the point. This is a no coffee drink which is perfect for those who despise the taste of coffee. It is smooth and icy, which helps to cool you off in the summer. You can order just a plain Strawberry Lemonade, but where would be the fun in that? The Strawberry Lemonade, un-blended, is a nice drink if you want it to accompany your lunch or dinner. But we are talking about the Blended Strawberry Lemonade, so let’s go and review that. This drink is absolutely delicious. It is cool and icy, so it has a slushie taste to it. The drink will stay cool, unless you leave it for a very long time to warm up. It is also a drink that kids could have since there is no coffee This drink is also a fairly priced, less than $4 for a Venti. And finally, you can add other flavors to this drink, like mocha and white chocolate. My personal favorite is mocha because you then get a chocolate covered strawberry drink. 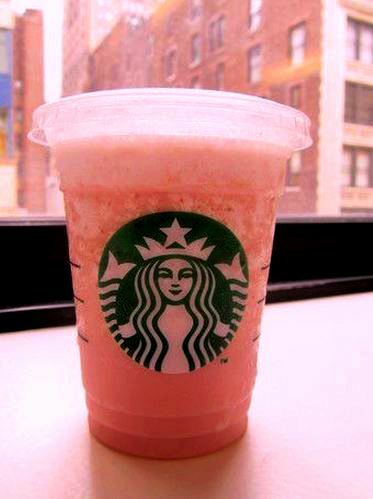 So when you go to Starbucks, you can go ahead and say you want this drink. No need to bring your own recipe. The baristas know the drink, so go ahead and order away. 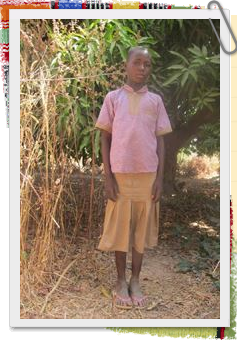 This is just the beginning of this kind of blog. There are so many secret menu items, and I will take the time to try them all. Let me know in the comments if there is an item on the secret menu that you want me to try. Happy St. Patrick’s Day! 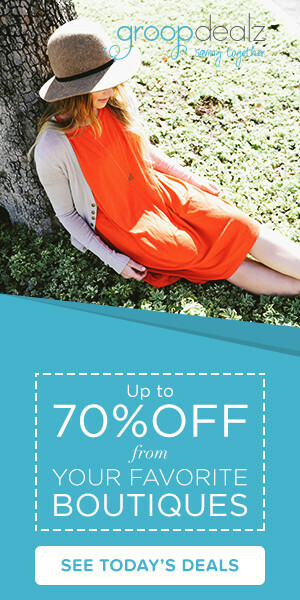 We have a special edition for you just for the holiday! 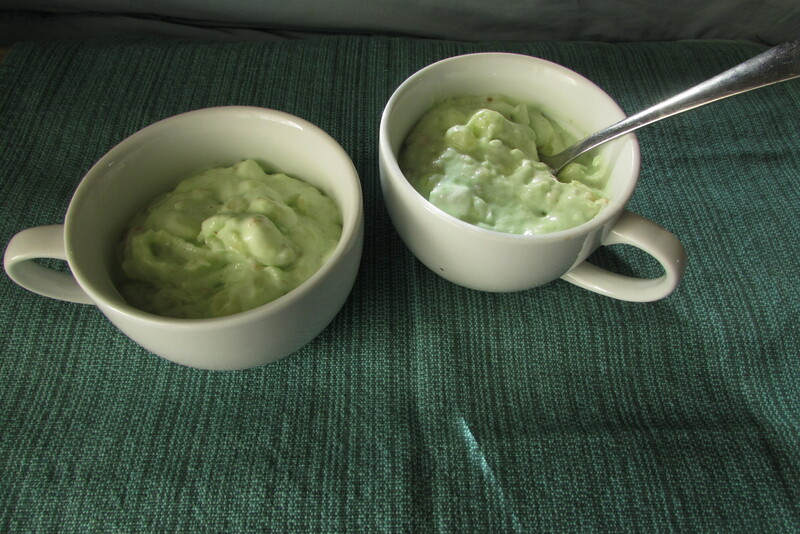 This is such a simple recipe! 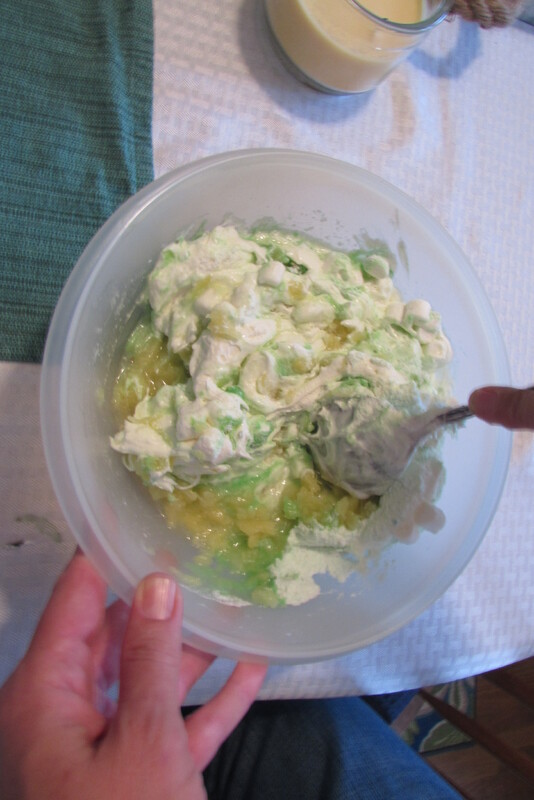 You can whip it up in no time! 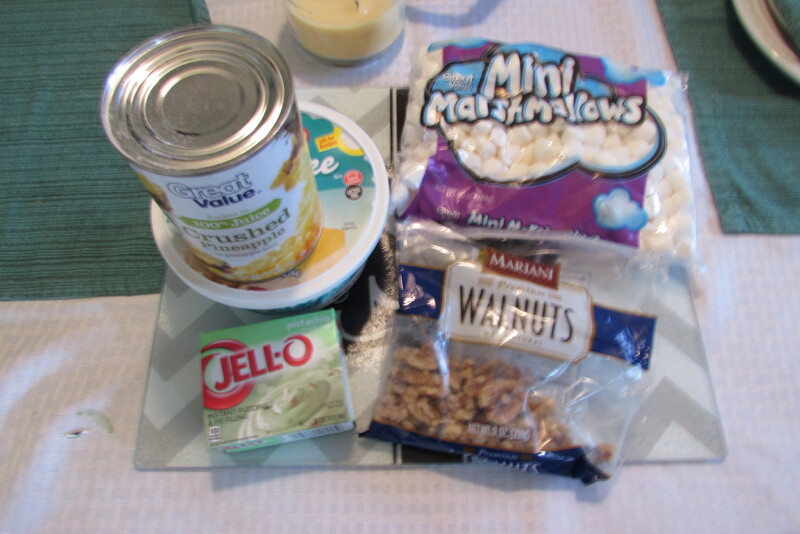 Place all ingredients in a bowl. 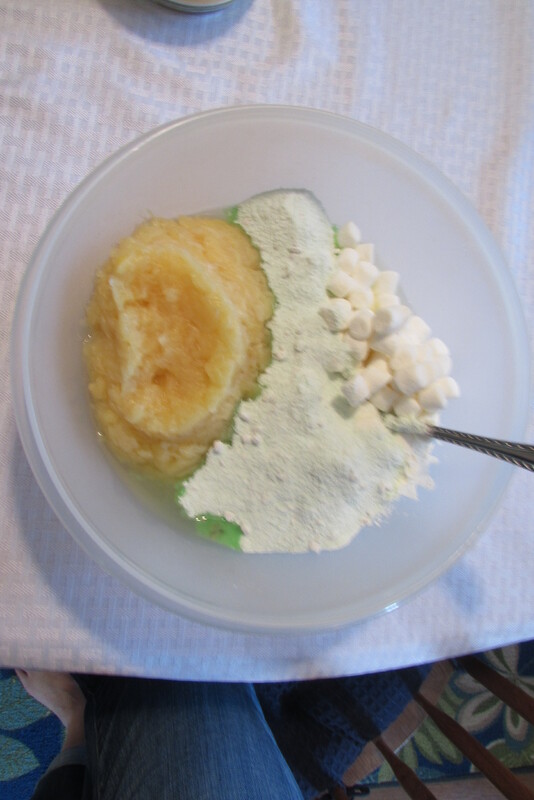 Don’t add milk to the pudding-just the powder. That’s it! So simple! 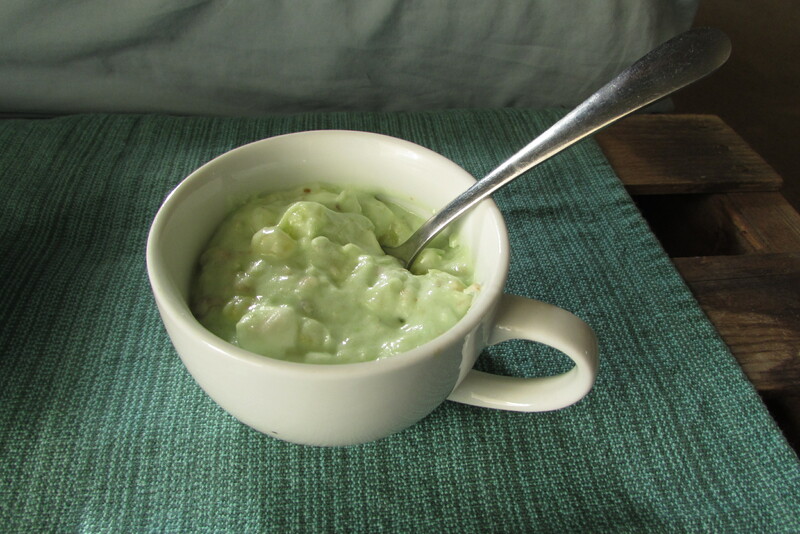 You can eat it right away, but it tastes better after it’s chilled and the flavors have melded together. Spring fever is running high here! The weather is beautiful and it is so nice to have it be light later into the evening. I love to spend time outside, but it is still pretty cool in the evenings. 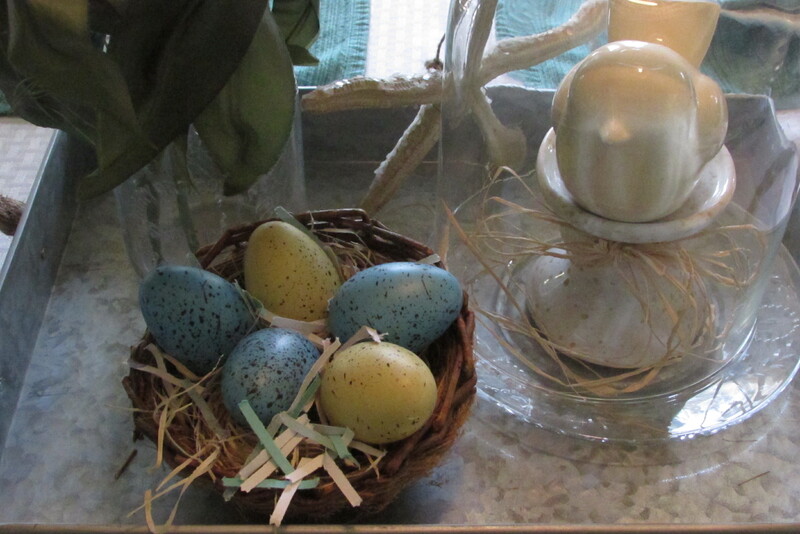 So instead, I decorated the dining room table (actually the only table I have). I received this table from my grandparents. They bought it when they first got married in 1928. Unfortunately the top is pretty scratched up and scarred from when the girls were little. I am still trying to decide if I want to refinish it or paint it. The original chairs have been put into storage. 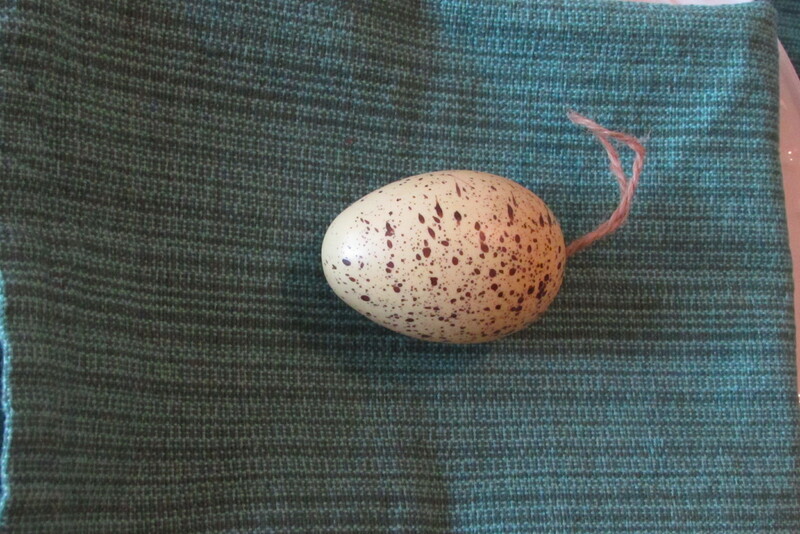 They were getting a bit creaky from too much use, so I hope one day to release them and bring them back into my home. 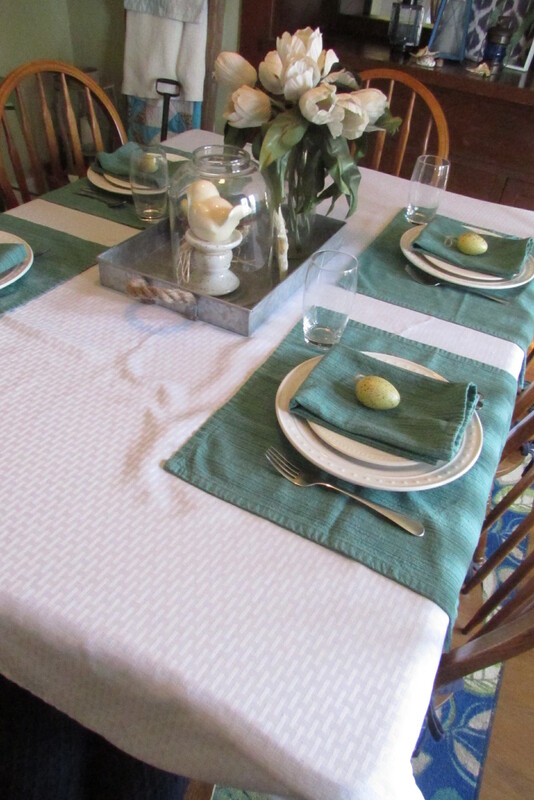 I covered the table with a white tablecloth and then added green/turquoise napkins. I draped them over the side of the table and really like how it looks. 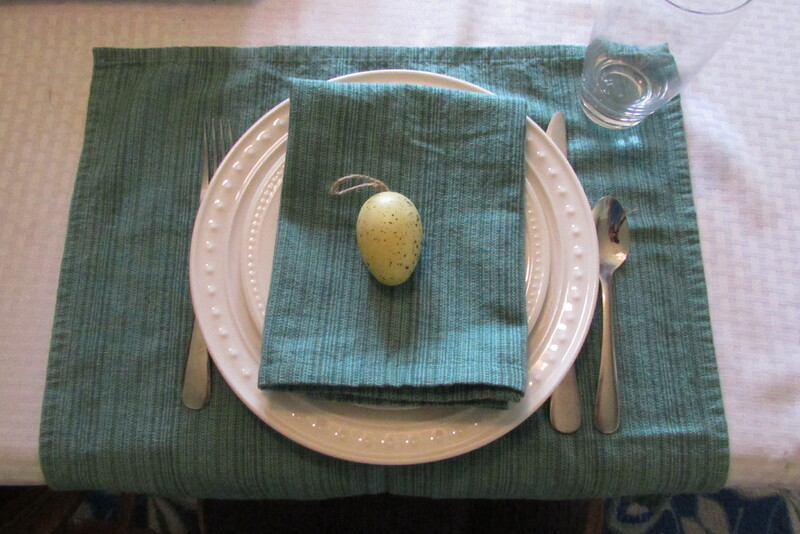 I added my white plates, another napkin and a small speckled egg to each place-setting. I really liked how this turned out! 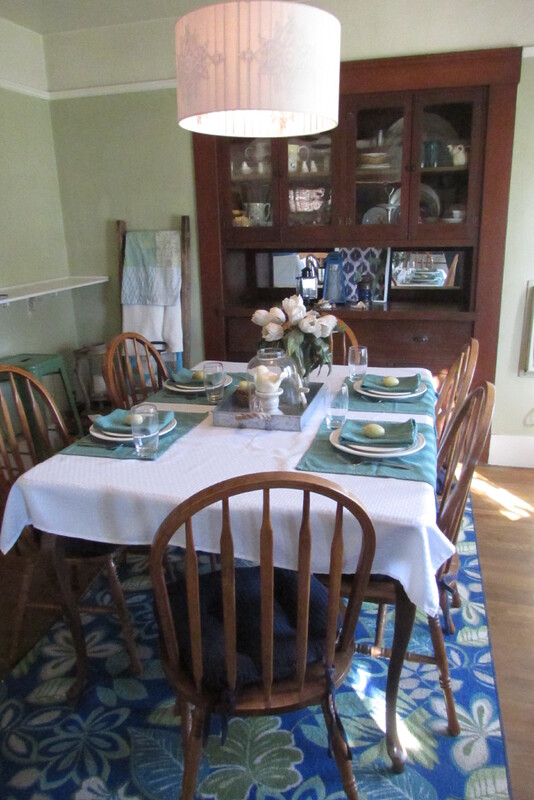 I used a galvanized tray with rope handles in the center of the the table. I love using trays, because they contain everything, plus they can easily be moved if needed. Haley says I usually add to much stuff to my displays, so I tried to keep it really simple. 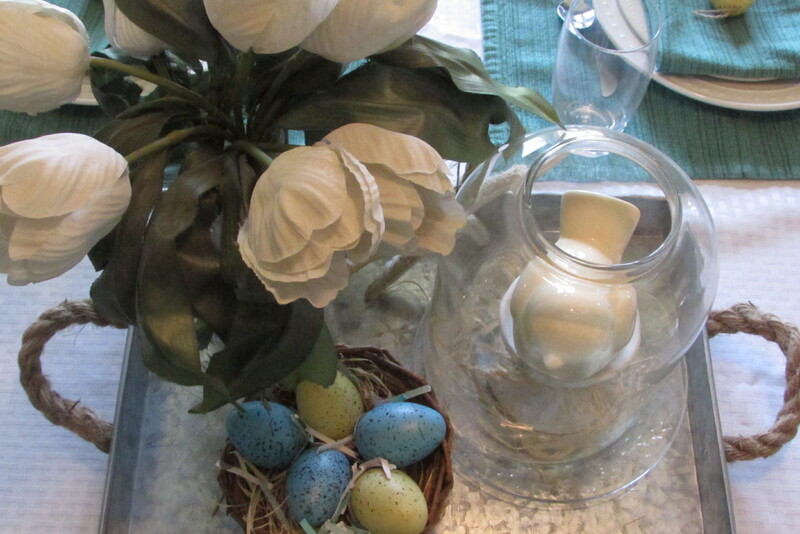 I added white tulips (faux, because I couldn’t find the real thing! 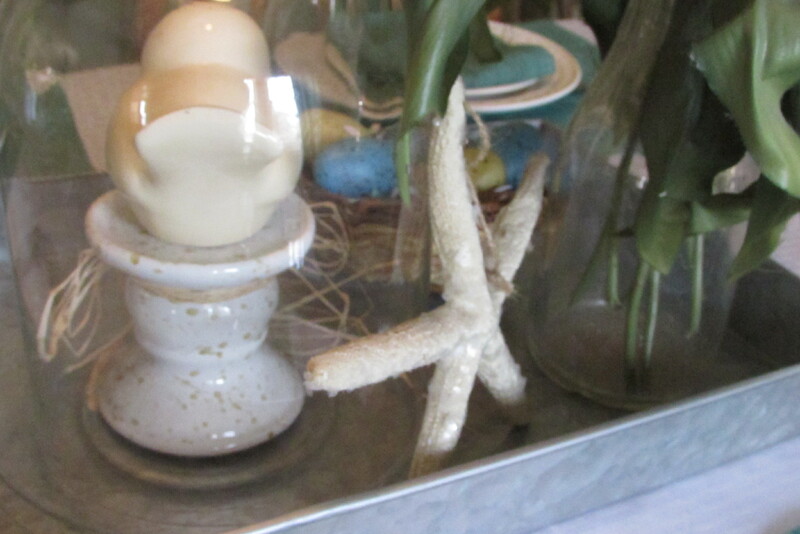 ), eggs and a nest, a white bird in a cloche and my signature starfish. A little touch of the beach! I hope you enjoyed this mini tour as much as I enjoyed putting it together! Do you decorate your table for the seasons too? 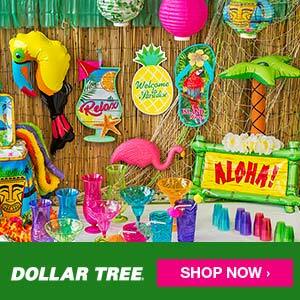 I would love to hear what you do to decorate for spring!